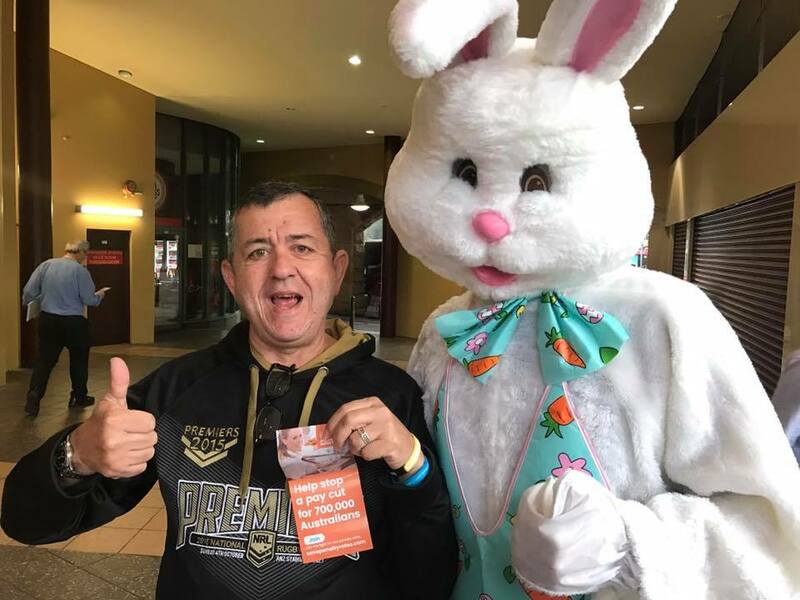 The Easter Bunny has hopped into the campaign to protect penalty rates joining retail workers and union members at Sydney’s Central Station to hand out Easter eggs and talk to commuters about the campaign. “If retail workers are forced to sacrifice precious time with their families over the Easter break, they must be properly compensated for it” the Easter Bunny said. SDA NSW Secretary Bernie Smith agreed and said that retail workers would be hit hard by the cuts to penalty rates on Sunday’s and public holidays as there had been no pay rise to protect their take home pay. Mr Smith said that recent polling had demonstrated a strong majority of Australians disagreed with the FWC decision to slash Sunday and public holiday penalty rates, that the Turnbull Government has supported. “I hope Malcolm enjoys Easter with his family. Everyone deserves a break. As he takes time out he should spare a thought for workers in retail and hospitality working this Easter who face a pay cut. Supporters of the penalty rates campaign can join at www.protectpenaltyrates.org.au or find us on Facebook.